All that 15-year-old Aakash wants to do is make mimicry videos and post them online. Instead, he finds himself in an IIT coaching institute called Genius Infinity, where he is a misfit, unable to cope with the syllabus, and placed in the notorious section D. Now, along with roommates Bakri and Chudail, Aakash will learn to answer life's multiple-choice questions. 15 year old Aakash is forced by his father to get into IIT and before he can realise, he finds himself in the bottom most division of Genius Infinity, an IIT coaching institute. A complete misfit at the institute, academics seem just way too fast for Aakash to grasp. But with his father's dreams in his eyes, giving up is something he cannot consider. Unable to cope up with academics, Aakash grows more and more frustrated. Disappointing results and severe discrimination in the institution only makes matters worse. As he begins to realise that it isn't a level playing field, Aakash finds it difficult to believe that he can get into IIT only through hard work. Aakash achieves his dreams of getting into section A but as he makes himself comfortable in his new surroundings, Chandrakanth refuses to let him be one amongst the elite and strongly opposes him. His results improve and he revels in his parent's appreciation but begins to miss his friends. Chandrakanth's actions place Moorthy in a difficult situation forcing him to take extreme measures. Aakash finds himself in troubled waters and a way out seems impossible. The boys must now stay one step ahead of Moorthy if they want to survive. But time is running out and Moorthy is a tough adversary. Moorthy turns into a totalitarian dictator and Aakash finds himself blamed for all the discontent in the institute. With the living conditions falling and everyone's stress levels rising, even the teachers choose sides. Aakash's parents pay a surprise visit which leads to disastrous consequences. After a heart to heart with an old friend, Aakash decides that he no longer wants to be at Genius Infinity. But leaving proves difficult as Aakash realises that all the students of the institute are at the tipping point of their rage. Expectation - genius infinity. Reality - system overload. 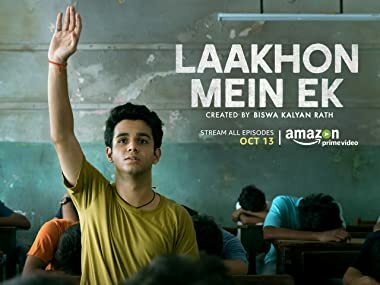 Three boys, hostel living, a campus for a pre-IIT coaching institute, the burden of expectations - Laakhon Mein Ek takes a hard yet amusing look at the realities of student life.